After getting the FMT Pro mortise and tenon jig as an early Christmas present, I’ve been busy setting it up, figuring out how it works, and making the mortises and tenons for the Kevin Rodel side chairs. There are a total of 5 mortises on each rear leg, 3 on the inner face (crest rail, back rail, seat back rail) and 2 on the front face (seat side rail, side stretcher). The front legs also have 3 mortises, 2 on the rear face (seat side rail, side stretcher) and one on the inner face (seat front rail). 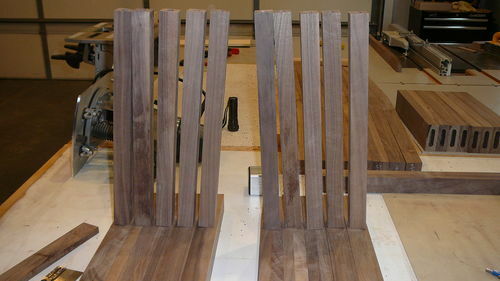 Additionally, the seat side rails have mortises for loose tenons, as do the side stretchers. I’ll explain why the loose tenons were necessary in a bit. 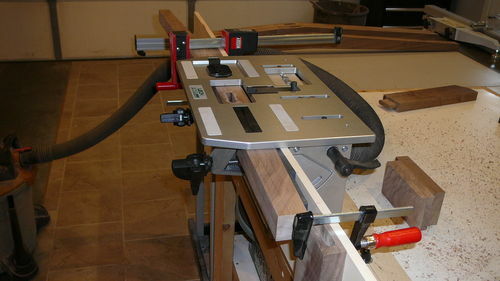 Even though the FMT Pro only needs the center point of the mortise I laid out all of the mortises and tenons to make sure everything matched up and to use later as reference when using the jig to cut the mortises. Since there are left side and right side parts and front/back and top/bottom alignment concerns I labelled each piece as well. That might be the most important detail to keep from cutting the wrong piece and having to go back and make a new one. I started with the seat front rail because it was a straight forward, 90 deg mortise and tenon, a good place to start. Since I was new to the FMT Pro, I checked each one with the digital calipers and then dry fit them. Perfect fit. The next set of mortises were the seat side rails. 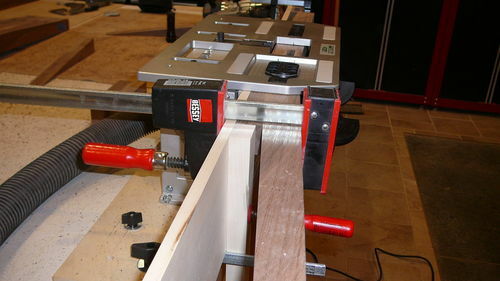 Previously, the side rails had been cut to length by tipping the table saw blade to the 85.5 deg angle for the parallel cross cuts on both ends. 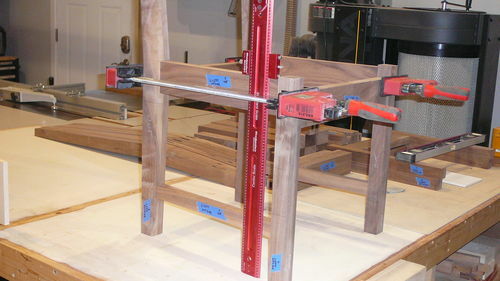 Initially, I though the side rails didn’t need to have loose tenons but the intricacies of getting the angle correct on the cheeks of the tenon would have meant the tenon would have been cut at 85.5 deg. It probably would work but my inexperience with the FMT Pro and the fact that the instructions called for loose tenons steered me away from trying it. With the loose tenons, the seat side rail mortises were also regular 90 deg mortises, as were the side stretchers. With the easy mortises finished it was time to dive into the more complicated ones. Since the front of the chair is wider than the back, the side rails flare out at an 85.5 deg angle. The Wixey digital angle gauge and tilting clamp fence on the FMT Pro made quick work of the set up. 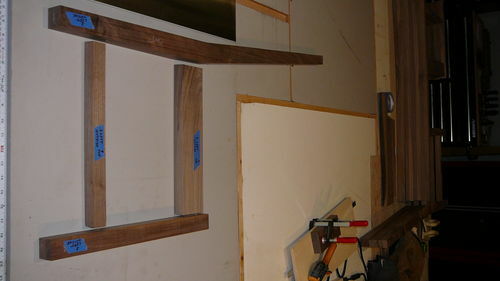 The front leg seat side rail mortise and the side stretcher mortise were finished along with the necessary loose tenons. The most challenging aspect was making sure the legs were correctly oriented with respect to the angled mortises. 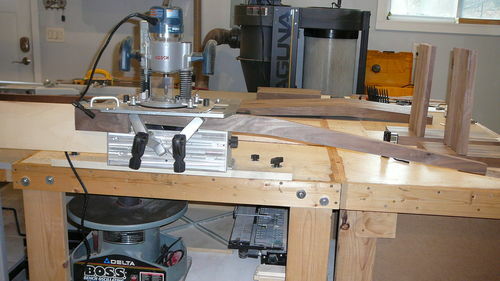 Since the legs are mirror images, the right side pieces were clamped to the jig on one side and the left side pieces were clamped on the other side. Another case where going slow and checking everything twice before cutting avoids re-work. The front face of the rear legs have a mortise for the seat side rail and the side stretcher. Leaving the FMT Pro clamp fence tilted at 85.5 deg both mortises were finished. As a check, I decided to see how everything fit together. Everything fits tightly and looks good. Time to work on the chair back details. Thanks for taking the time for such a detailed blog. I’ve Favorited it for reference when I get to making mine. You are making good progress Earl. Looks like things are coming together nicely! Hope you are enjoying using the Leigh FMT. Great blog. 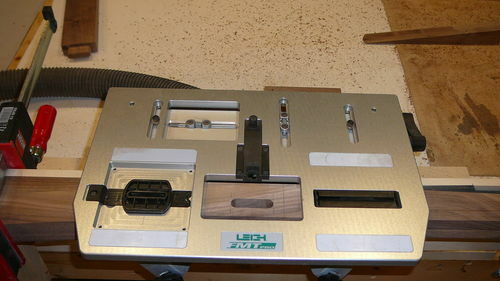 This is the perfect project for your new jig. I bet it handles angled loose tenons quite well.